This article will aid users in reviewing an Outside Activities Report (OAR) in the Streamline (BPLogix/eWorkflow) application. Pursuant to UW System policies, all Faculty, Academic Staff, and Limited appointees with appointment of half-time or greater must report outside activities annually. Each appointee will receive an email from UWM HR via the UWM eWorkflow Process Director. The Outside Activities Disclosure Review is due by April 30 each year. Any questions regarding this request should be directed to the UWM Help Desk. To complete the review, begin by opening your campus email. 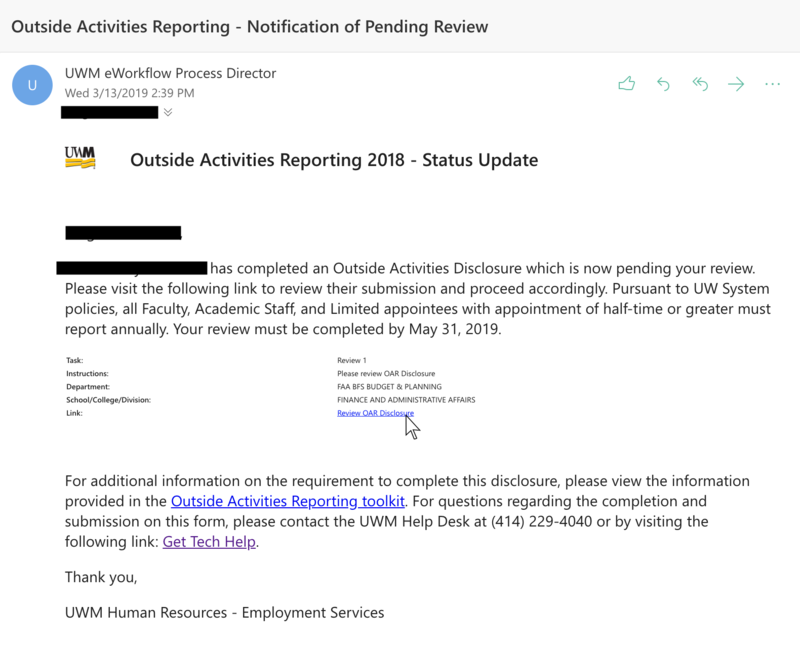 Click to open the email from UWM eWorkflow Process Director titled Outside Activities Reporting – Notification of Pending Review. Note: You can also access your disclosure review by going to uwm.bplogix.net if you lose the email or have emails for multiple disclosures you are required to review. 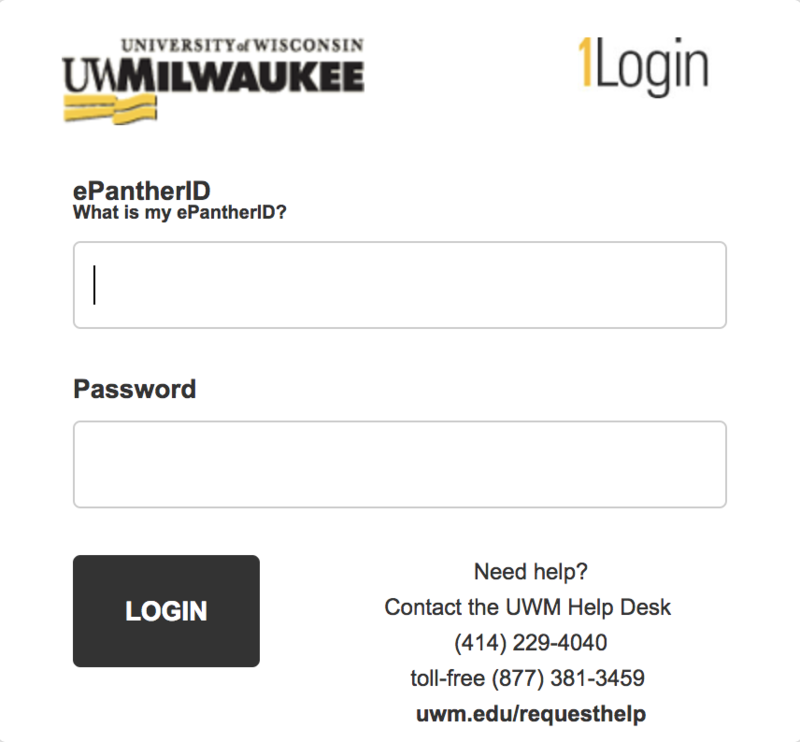 A new tab will open with a UWM 1Login screen. Note: You might be prompted to allow pop-ups. If this happens allow pop-ups for this site in your browser. After logging in, you will be brought to your Task List. Your Task List will show a list of OAR disclosures that need your review. Note: Once you allow pop-ups you will be taken directly to the disclosure from clicking the link in your email. Click on the OAR Disclosure you wish to review. This will open the disclosure in a new window. Confirmation that there are no remunerative outside activities or associations to report. Review if the reporter has received net remuneration. Review if the reporter has received compensation from a nongovernmental sponsor. Note: This can be verified by scrolling to the bottom of the disclosure and reviewing the Routing Slip. If you have any comments regarding the OAR Disclosure type or paste them in the Approver Comments box. Note: If you select this option you will have to review the complete form again. After approving or returning the disclosure, you will be brought back to the Task List. If you have more disclosures to review, complete this process again for each disclosure. Thank you for completing your OAR disclosure review. If you have any questions visit our BP Logix (FAQ) Outside Activities Reporting page.